Ubicación de eventos (existir, tener lugar). Localización de un objeto, persona (hallar, encontrarse). Soy enfermo. -- Using Soy here defines a characteristic. I am a sick person. Estoy feliz. -- Using Estoy here defines a Emotion. I’m happy now. Soy feliz. -- Using Soy defines a characteristic. I am happy by nature. Soy de México. -- Using Estoy here defines Origin. I am from Mexico. 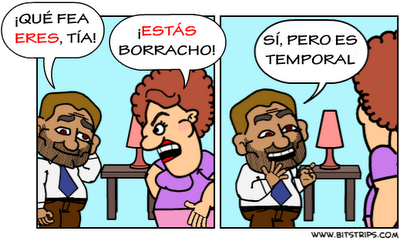 1.- Hoy _________ su día de descanso, por eso no _________ aquí. 2.- La conferencia va a ________ en el aula magna. 3.- Como su familia ________ fuera, entra y sale cuando quiere. 4.- Yo ________ tan nerviosa porque aún no sé el resultado del examen. 5.- Juan ________ muy nervioso por eso nunca hace trabajos de precisión. I don't know if this helps anyone but I also stumbled across this page that might also be of help with how to conjugate the verb ser . "Es" is the third person singular conjugation of "ser." 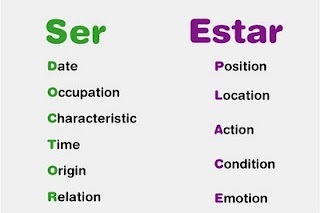 "Ser" is used usually for more permanent things (not always- there are big exceptions, like location, which would be permanent (estar) and the time, which is not. (ser)) "Está" is the third person singular conjugation of "estar." good test. Do you have more tests ser/estar; por/para; saber/conocer?? Or perhaps you can direct me to a website where I may find tests for the above? Thanks in advance. Saqué ocho sobre ocho . Gracias por el test.